By moving above 1.1447, price should move higher to reach between 1.1459 and 1.1472, while remaining above 1.1365 and ideally above 1.1409. Elliott Wave chart analysis for the EURUSD for 20th March, 2019. Please click on the charts below to enlarge. Pink wave a is likely forming a zigzag labeled green waves (a), (b) and (c). Green wave (a) formed an impulse labeled orange waves i through v.
Green wave (b) formed a shallow flat labeled orange waves a, b and c.
Orange waves i, ii and iii are complete. 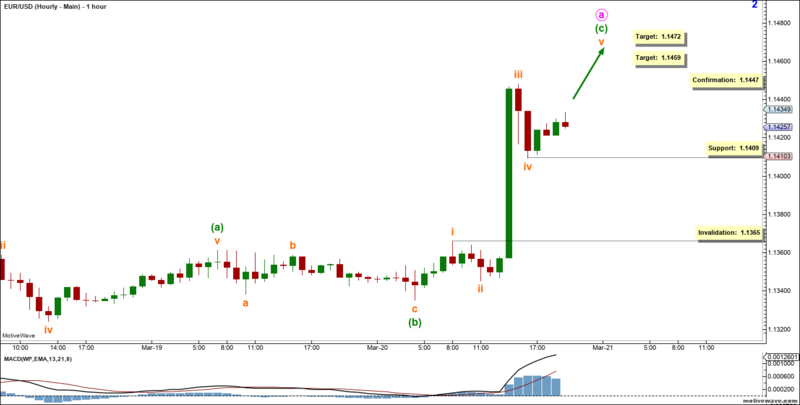 Orange wave iv retraced 38.2% of orange wave iii. It’s very likely to be complete as well. 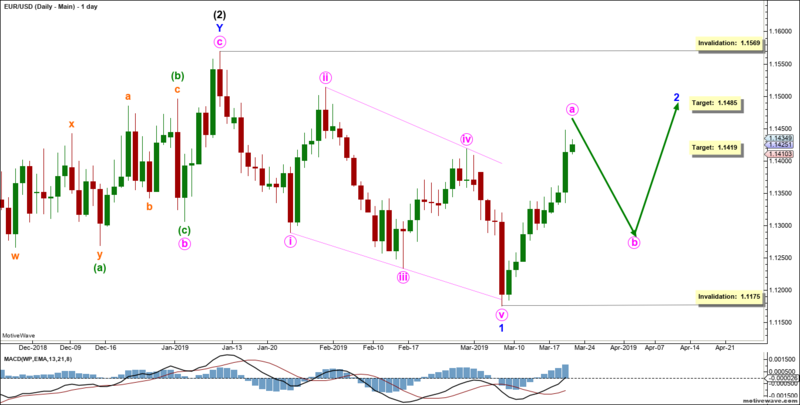 This count expects the euro to move toward the upside in orange wave v to complete green wave (c). This would be confirmed by movement above 1.1447. At 1.1459 orange wave v would reach 161.8% the length of orange wave i, then at 1.1472 it would reach 61.8% the length of orange wave iii. This wave count would be invalidated by movement below 1.1365 as orange wave iv of this impulse may not enter the price territory of orange wave i. However, it’s very likely that the market will find support around what appears to be the end of orange wave iv at 1.1409.